October is National Car Care Month | Hinman and Peck, P.C. October is national car care month. National car care month was created by AAA in the 80’s to emphasize the importance of maintaining a vehicle for safety. October is the perfect time to have to have your vehicle checked in order to avoid auto accidents this winter season. Spending some time now on maintenance and preventative measures can help you to avoid a costly emergency breakdown in the harsh winter months. To keep your vehicle working at its optimum levels, please find the following free car care tips. Check Vehicle Fluids. 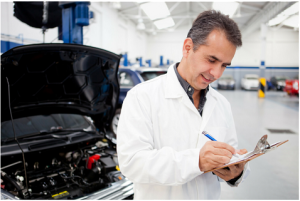 Fluids to check include engine oil, power steering, brake and transmission fluids and windshield wiper and antifreeze. Ask your car care professional about possibly changing to winter weight oil. Check Hoses and Belts. Check your hoses and belts for signs wear including fraying and cracking. Check the Filters. Filters such as air, fuel and PCV should be checked. A poorly running engine uses fuel less efficiently, costing more in gas. Check the Brakes. Check the brakes including linings, rotors and drums. Add De-icer. If you live in an area that will get below freezing during winter, adding fuel de-icer to your gas tank once a month can prevent moisture from forming. Check the Battery. Look at connections to confirm they are clean and corrosion-free. Check the HVAC system. Make sure your system is in working order for de-frosting. Check the Tires. Have a professional give an assessment as to the condition of your tires and find out if snow tires are recommended. Replace windshield wipers. Functioning windshield wipers are crucial in rain and snow. Winter blades may be in order in harsh winter climates. Check lighting. Make sure that both interior and exterior lights are in working order. Keep gas tank half full. In order to prevent possible freezing as moisture can form in gas lines, keep your tank at least half full during the winter months. Spending the time in October to prepare your vehicle for the winter season will give you peace of mind. In addition, you will improve your gas mileage, reduce pollution and find small issues before they become major problems, possibly leading to accidents during the cold winter months.